IT’S HERE!! We’ve been waiting for this steroids infused machine all year! The first reviews and tests are in and they look promising! Experience workstation-class performance in the iMac form factor with the space gray Apple 27″ iMac Pro with Retina 5K Display Edit Suite – Coming Soon! 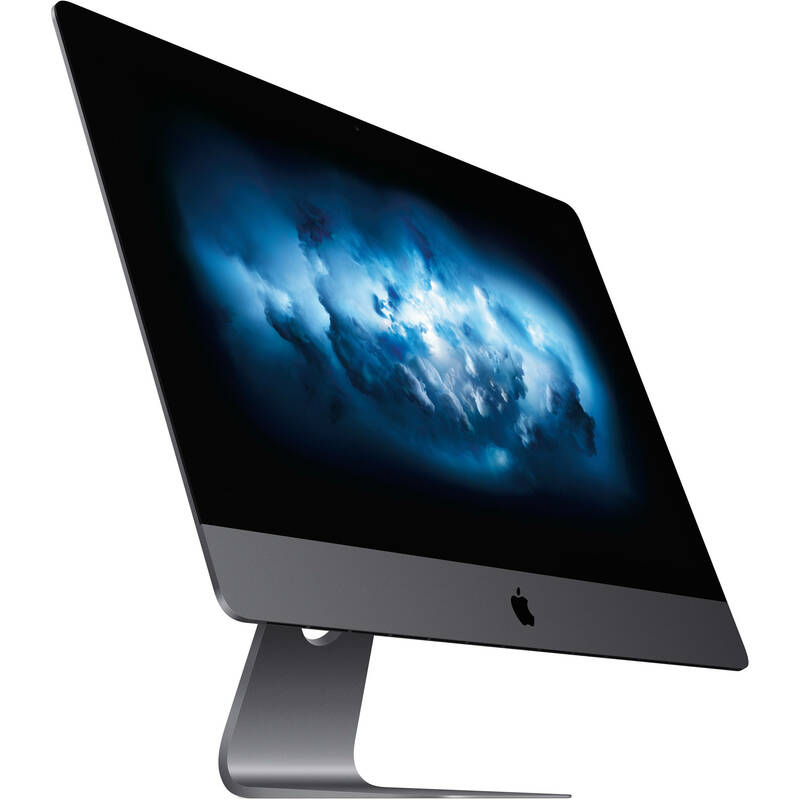 Featuring a 2.5 GHz Intel Xeon W 14-core processor and 32GB of 2666 MHz DDR4 ECC RAM, the iMac Pro is designed to handle demanding pro workflows, such as pro photo work, pro video editing, advanced graphics editing, virtual reality content creation, and real-time 3D rendering. The iMac Pro also has 1TB of all-flash storage, which has a 3.3 Gb/s read speed and a 2.8 Gb/s write speed, for loading huge files and launching apps faster. In addition to a workstation-class processor, the iMac Pro also provides workstation-class graphics, thanks to the dedicated AMD Radeon Pro Vega 56 graphics card. With up to 8GB of HBM2 (High Performance Memory) VRAM and a 400 MB/s memory bandwidth, the Radeon Pro Vega 56 GPU delivers up to 11 teraflops of single precision and up to 22 teraflops of half precision. Still just 5mm at its edge, the iMac Pro features the 27″ Retina 5K display with a 5120 x 2880 resolution and a 16:9 aspect ratio. With up to 500 nits of brightness, a P3 wide color gamut, and support for one billion colors, the Retina 5K display delivers a vivid, true-to-life viewing experience. The iMac Pro features a 10Gb Ethernet port, which is up to 10 times faster than the 10/100/1000 Mbps Gigabit Ethernet port found on the previous generation iMacs. The 10Gb Ethernet port also supports Nbase-T industry-standard 1Gb, 2.5Gb, and 5Gb link speeds. If you would rather go wireless, you can utilize the dual-band 802.11ac Wi-Fi. The iMac Pro also has Bluetooth 4.2 technology, as well as a UHS-II SDXC media card slot, four 40 Gb/s Thunderbolt 3 ports, four USB 3.0 Type-A ports, and a FaceTime Full HD camera. There is also the Apple T2 chip. The installed operating system is macOS High Sierra.